By accessing any areas of m.ferrickmovers.com and www.ferrickmovers.com, users ("Users") agree to be legally bound and to abide by the terms set forth below. m.ferrickmovers.com and www.ferrickmovers.com is owned and operated by Ferrick Bros. Moving Company, L.L.C.. Any references herein to m.ferrickmovers.com and www.ferrickmovers.com shall be deemed to refer to Ferrick Bros. Moving Company, L.L.C., as applicable under the circumstances. Nothing on this Ferrick Bros. Moving Company, L.L.C. web site, m.ferrickmovers.com and www.ferrickmovers.com, shall be construed as conferring any license under any of Ferrick Bros. Moving Company, L.L.C., or any third party's intellectual property rights, whether by estoppel, implication, or otherwise. User expressly agrees that use of m.ferrickmovers.com and www.ferrickmovers.com is at User's sole risk. Neither Ferrick Bros. Moving Company, L.L.C., nor its affiliates, nor any of their officers, directors, or employees, agents, third-party content providers, merchants, sponsors, licensers (collectively, “Providers”), or the like, warrant that m.ferrickmovers.com and www.ferrickmovers.com will be uninterrupted or error-free; nor do they make any warranty as to the results that may be obtained from the use of m.ferrickmovers.com and www.ferrickmovers.com, or as to the accuracy, reliability, or currency of any information content, service, or merchandise provided through m.ferrickmovers.com and www.ferrickmovers.com. Ferrick Bros. Moving Company, L.L.C. reserves the right to make changes to m.ferrickmovers.com and www.ferrickmovers.com without notice. THIS SITE IS PROVIDED BY FERRICK BROS. MOVING COMPANY, L.L.C. ON AN “AS IS” AND “AS AVAILABLE” BASIS. 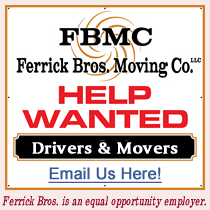 FERRICK BROS. MOVING COMPANY, L.L.C. MAKES NO REPRESENTATIONS OR WARRANTIES OF ANY KIND, EXPRESS OR IMPLIED, AS TO THE OPERATION OF THE SITE, THE INFORMATION, CONTENT, MATERIALS OR PRODUCTS, INCLUDED ON THIS SITE. TO THE FULL EXTENT PERMISSIBLE BY APPLICABLE LAW, FERRICK BROS. MOVING COMPANY, L.L.C. DISCLAIMS ALL WARRANTIES, EXPRESS OR IMPLIED, INCLUDING BUT NOT LIMITED TO, IMPLIED WARRANTIES OF MERCHANTABILITY AND FITNESS FOR A PARTICULAR PURPOSE. FERRICK BROS. MOVING COMPANY, L.L.C. WILL NOT BE LIABLE FOR ANY DAMAGES OF ANY KIND ARISING FROM THE USE OF THIS SITE, INCLUDING BUT NOT LIMITED TO DIRECT, INDIRECT, INCIDENTAL PUNITIVE AND CONSEQUENTIAL DAMAGES, DAMAGES FOR LOST PROFITS, LOSS OF REVENUE OR LOSS OF USE. NO ORAL ADVICE OR WRITTEN INFORMATION GIVEN BY FERRICK BROS. MOVING COMPANY, L.L.C. NOR ITS AFFILIATES, NOR ANY OF THEIR OFFICERS, DIRECTORS, EMPLOYEES, AGENTS, PROVIDERS, OR THE LIKE, SHALL CREATE A WARRANTY; NOR SHALL USER RELY ON ANY SUCH INFORMATION OR ADVICE. Under no circumstances shall Ferrick Bros. Moving Company, L.L.C. or any other party involved in creating, producing, or distributing of m.ferrickmovers.com and www.ferrickmovers.com be liable for any direct, indirect, incidental, special, or consequential damages that result from the use of or inability to use m.ferrickmovers.com and www.ferrickmovers.com, including but not limited to reliance by a User on any information obtained from m.ferrickmovers.com and www.ferrickmovers.com or that result from mistakes, omissions, interruptions, deletion of files or email, errors, defects, viruses, delays in operation or transmission, or any failure of performance, whether or not resulting from acts of God, communications failure, theft, destruction, or unauthorized access to m.ferrickmovers.com and www.ferrickmovers.com's records, programs, or services. User hereby acknowledges that this paragraph shall apply to all content, merchandise, and services available through m.ferrickmovers.com and www.ferrickmovers.com including, but not limited to any files that are downloaded. Because some states do not allow the exclusion or limitation of liability for consequential or incidental damages, in such states liability is limited to the fullest extent permitted by law. Any appliance being moved should be disconnected before movers arrive at your home. It is the customer's responsibility to have all appliances prepped according to manufacturer's guidelines. Customers can go YouTube (www.YouTube.com) and enter brand of appliance; then shipping bolts. (Example: Samsung Front End Washer Shipping Bolts) NOTE: There should be a YouTube video for most brands. Links to other web sites provided on m.ferrickmovers.com and www.ferrickmovers.com are provided as Internet navigation tools only. Unless otherwise specified, Ferrick Bros. Moving Company, L.L.C. prohibits the use of Ferrick Bros. Moving Company, L.L.C. LOGO(s) or NAME(s) or any other LOGO(s) or NAMES(s) appearing on this web site.